Mirror displays or also magic mirror displays are increasingly being used – sometimes also as touch screens – because they combine two useful functions: one of being a mirror and the other of being an information display. On the modern multimedia mirror displays, various information such as date and time, weather, advertising – and with the flexyPage mirror displays for elevators – also elevator information such as floor level, travel direction, door status, position of the cabin, elevator speed and load can graphically and impressively be displayed. The elegant, yet modern design of the mirror displays and their additional functionality as mirrors make them an absolute eye-catcher at the point of sale in retail, fashion stores, cosmetic and drug stores or in hotels, and ensure an effective customer communication and customer approach. 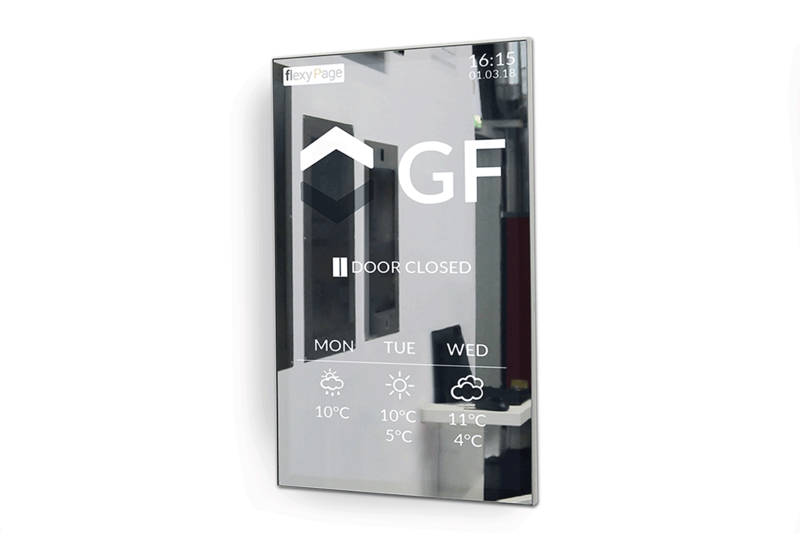 The flexyPage mirror displays offer the same functionality as all other flexyPage displays, and can conveniently be used and configured via the Internet with or without elevator connection – for full flexibility and state-of-the-art technology in every building. For mirror displays, we recommend to use strong colors like neon in the screen design. These colors achieve the best effect in terms of their visual perception due to their high contrast and strong luminosity. With the flexyPage Editor, you can easily create your own screen designs, or you can assign our designers to create a professional screendesign for your individual application. It is also possible to roll out advertising campaigns on a mirror display with the software application flexyPage Campaign.